Great savings on Spring holidays plus get all inclusive as standard when you book. Fantastic Cruise sailing from Newcastle in June 2020. Fabulous savings on this 10 or 11 night itinerary departing 26th & 27th April. Where do I use my Marella Cruises voucher code? 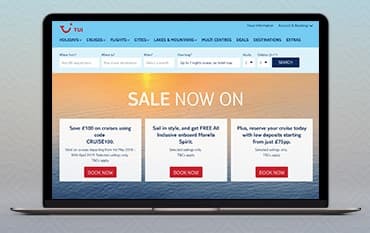 Select the code you wish to use, copy it and follow the link to tui.co.uk/cruise. Choose a TUI cruise package and click ‘Continue’. Enter your holiday details, choose your sailing dates, and add any optional extras before clicking ‘Continue Booking’. Check the details for your booking and on the last booking page, you can enter your code. The total price of your cruise will update in the summary on the right-hand side of the page. With an ever-expanding fleet, you can discover a wide range of luxury Marella Cruise ships including the Marella Explorer, the Marella Discovery, the Marella Dream, the Marella Celebration, the Marella Spirit and the Marella Discovery 2. Each of these cruise ships offers incredible facilities including a huge array of restaurants and bars as well as things like indoor and outdoor cinemas, sports and family decks, rock climbing walls, mini golf courses, gyms and indoor pools and even a five-storey atrium. When it comes to entertainment Marella Cruises have it covered, so while your sailing to your next destination you can enjoy plenty of activities both in the day and in the evening with things like show lounge sets, West End style shows and UK comedy acts. No matter which ship you choose, whether it’s the newest and biggest Marella Explorer, or the oldest serving Marella Spirit, you can expect nothing but sophistication, friendly service and a homely atmosphere. Select an all-inclusive package, a ship with flights and tips included or a cruise and stay package, and tailor-make the perfect holiday for you and your friends or family. Choose from cruises that leave from the UK, cabin only cruises, summer cruises to tropical locations like the Caribbean and Eastern Mediterranean, winter cruises to Iceland and the Arctic, all-inclusive cruises, family cruises, last minute cruises, European cruises to places like Barcelona and Sorrento plus much more. You can even organise and pay for plenty of extras while you’re booking your cruise, these extras include parking, car hire and on shore excursions. Unlike most cruise lines TUI Marella Cruises include tipping and service charges in their prices, so you don’t have to worry about carrying extra cash around once you’re on board. When booking you can also expect easy, flexible options to make travelling to your port and boarding your ship easy. Book a cruise and stay holiday, for instance – and your cruise package will include a hotel stay. You can also expect the friendliest on sea service and can benefit from the overnight sailings which allow you more time to adventure once you dock. A cruise is a one of a kind experience that everyone has to try at least once in their life. With Marella Cruises, you can tailor make your offshore holiday- choosing the location, dates, type of ship, cruise package and type of cruise to ensure that you have the best experience possible. Marella Cruises in 2019 have already begun, but there’s still time to book now and even start planning a 2020 cruise. Browse around for the best deals in the sale section, or use one of our voucher codes to book and look forward to a summer or winter cruise to stunning places around the globe. If you’re booking at the last minute, don’t worry, there’s plenty of late cruise deals available, enabling you to sail away in just a few weeks on a holiday of a lifetime. Marella Cruises Asia take you round the most popular tourist locations, providing astonishing views that you wouldn’t be able to appreciate if you were on foot. This part of the world is covered in silk-soft beaches and sizzling street food, offering everything from sacred Buddhist temples to world-famous beaches. TUI’s Asia Marella cruises take you everywhere from tiny city-states like Singapore to the tropical islands of Thailand and Malaysia. In terms of landscapes, you’ve got all the works on Far East cruises. Sri Lanka and Vietnam offer swirled rice paddies and the limestone peaks of Halong Bay, while islands like Koh Samui and Phuket bring white bright-white beaches and natural wonders. As well as natural beauty there are also the bustling cities, each one with its own personality. Discover the lively streets of Mumbai, the temples and buzzing markets in Bangkok, and soaring skylines in Kuala Lumpur and Singapore. How much luggage can I take on the cruise? You can check in 20kg. You can share your allowance with others on your booking, but no single bag can be more than 23kg. This is for health and safety reasons. You can also take 1 piece of hand luggage weighing up to 7kg and with maximum dimensions of 55x40x20cm. What’s the check-in time for my cruise? You'll be able to check in as soon as your transfer from the airport arrives in the port. If you're sailing from the UK you can check in at the cruise terminal between 1pm and 3pm and board thereafter. Please use the Shop Finder to find your nearest TUI travel agents and it’s address, opening and closing times. Shore excursion enquiries: 0203 451 2728 or visit website. Upgrades and extras information can be found here. Calls from UK landlines cost the standard rate. Calls from mobiles may be higher. Please check with your network provider. Cruise along breathtaking horizons in some of the most stunning places on the planet with Marella Cruises. Discover everything from sandy shores to glistening glaciers with a variety of fantastic cruise ships that sail to over 120 destinations around the world. Enjoy premium travel and entertainment onboard your ship whilst travelling from location to location, all in one offshore holiday. Choose from deluxe sailings, ultra-modern cruises, family-friendly all-inclusive TUI cruises, or low key sail breaks on smaller, more intimate cruise ships. Whichever you choose, you’re guaranteed the very best for an affordable price, and when you book with one of our money saving Marella discount codes you can benefit from even lower prices and better deals. We are constantly on the hunt for Discount Codes for Marella Cruises to help you with your money saving. Our experts check dozens of sites for secret codes including NHS discounts, student sites & social media channels saving you time & money!